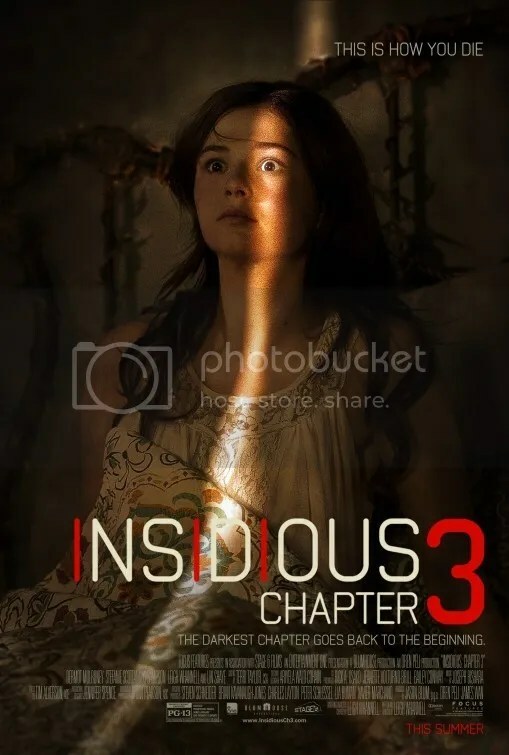 Insidious Chapter 3 is the inevitable prequel set before the events concerning the Lambert family in part one. Despite her third billed status, the drama revolves around teen Quinn Brenner (Stefanie Scott). Her mother has recently succumbed to cancer and Quinn misses her terribly. She goes to visit a spirit medium, Elise Rainier, played by returning cast member Lin Shaye. A warm presence, she is a welcome sight. Elise attempts to make contact and immediately feels an evil entity that strikes her with fear. She warns Quinn that when you try to speak to the dead, all of them can hear you. So the apparent moral is, “Don’t attempt to talk to your loved ones who have passed on.” Seriously? Insidious was an an effective chiller because it built suspense out of simple things. It was able to make a pair of shoes behind the curtains seem creepy or a shadowy figure outside the window. As the 2010 movie was refreshingly straightforward, Chapter 2 went the other route, becoming overly complicated with needless exposition to define everything we had seen in the first story. In this way the script undermined the source. It’s not unlike revealing the secrets behind how a magician performs his craft. You’re now more informed but less dazzled by what you initially saw. I guess the nicest thing I can say about Chapter 3 is that it doesn’t leave a stench as rank as Chapter 2. It’s not horrible – just dull. The narrative is utterly rote. There’s precious little creativity to justify why this was made. Actress Lin Shaye is vital as the psychic. Also back are paranormal investigators Tucker and Specs: Angus Sampson and Leigh Whannell. They’re mildly amusing. Unfortunately the plot relies on a lot of cheap jump scares that are more irritating than frightening. Furthermore, every single one is inserted exactly where you expect it, so they’re predicable as well as tiresome. Dermot Mulroney plays it sitcom campy as Quinn’s father. He acts as if he’s in a completely different film from everyone else. He’s a shouter in a room full of whisperers. Whannell returns as screenwriter and takes over directing duties this time. James Wan, the director of the previous installments, is now only a co-producer. While it’s an improvement over Chapter 2, the picture has significantly lower production values. If how Elise met Tucker & Specs has been keeping you up at night, then Chapter 3 might serve a purpose. Otherwise be good to your ears and watch something less discordant. This entry was posted on June 9, 2015 at 9:06 am and is filed under Horror with tags 2015. You can follow any responses to this entry through the RSS 2.0 feed. You can leave a response, or trackback from your own site. I really like Lin Shaye’s Elise – she was really the heart and soul of the original alongside Rose Byrne. If only the scriptwriters had managed to concoct a great story arc for her character over the three films. Oh well. 100% agreement. Lin Shaye is good. Still not fully in love with this franchise. Although, I agree, it’s great to see Shaye getting some much deserved time here. Nice review Mark. Yeah I don’t think it ever deserved to be a franchise, but Insidious was an excellent standalone film. Need to get your horror fix? Move on over to The Babadook. Lin Shayne deserves a Best Supporting Actress nomination for this one. I’ll admit she was the MVP of the picture. With that said, it was a pretty lackluster picture. Yeah, I didn’t like this one either. It looks like horror films will get worse before they get better. The Vatican Tapes is next in July. True, but at least that one gets a limited release (I think?). I think The Babadook is the movie which has kept my faith still burning about the quality of recent horror movies. CGI should be used to a minimum in horror movies, for eg. The Ring. It scared the crap out of me because of the horrifying visuals and there was always a sort of gloomy feeling woven around the movie. And horror movies should also be perfect as a thriller like in The Ring where the horror is part of an investigation. Insidious 1 was partly successful in doing so. And the most important thing is just ban the sequels. The ambiguous endings in horror movies are a pain the back. The Ring is one of my favorite horror films of all time. Most people became aware of Lin Shaye in the comedies of the Farrelly Brothers, but she actually has been acting since 1975! Mark, can you suggest some good horror movies for me to watch ? Some of my favorites are The Innocents (1961), Rosemary’s Baby (1968), Alien (1979), Poltergeist (1982), The Ring (2002). I prefer an eerie mood to outright gore. Alien has a moment that crosses the line but it’s the exception so it’s pretty effective. Thank you for the suggestions, Mark. I have watched The Ring but will definitely check the other ones out. Glad I didn’t go out of my way to see Insidious Chapter 3. Seems like it was a smart choice to skip it. I probably would be annoyed by a dull story with tons of predictable jump scares as well. So far not much horror of note in 2015. It Follows and…..hmmmm.